Cesarean section, also known as C-section, versus vaginal delivery has been explored as a risk factor for developing inflammatory bowel disease (IBD). During birth, bacteria from the mother and the surrounding environment colonize the infant's gut, and during C-section delivery this direct contact is absent. 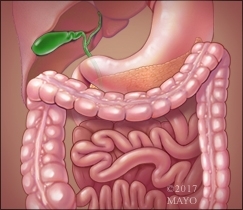 Dr. Sunanda Kane, M.D., discusses the most recent findings published in Gastroenterology, which suggest that alteration of the gut microbiome at birth, due to C-section, is not sufficient to enhance the risk for IBD.